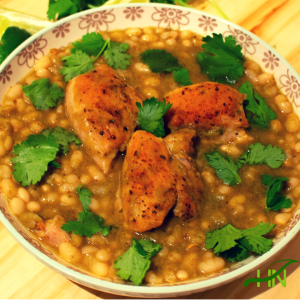 Chicken with white beans in a jalapeño sauce. Healthy dinner choice!!! Place beans in a pot with 6 cups of water. Bring to boil for 2 min and leave it aside for about 1 hour - after an hour has passed drain the water and add 5 cups of fresh cold water and cook beans until done; about 45min to and hour. Toss peppers, onion cut into quarter and garlic with 1tbs of olive oil and place it in a baking dish and put it under the broiler for about 10-15 min rotating once until the skin of peppers are charred. Remove peppers place in a bowl and cover. Meanwhile season chicken with salt and pepper. Brown chicken in a large saucepan with the remaining olive oil. Remove chicken from pan and set aside. Remove seeds and skin from peppers as well as the garlic. Place pepper, garlic, onion, cumin, coriander, oregano and 1tsp of salt add to blender and pulse until coarse. ( you can use some water from the beans to make it easy to blend. Place pepper mixture into saucepan and cook mixture for about 3 min then add beans, salt and pepper to taste and mix well. Return chicken to pan and cook for about 20 min . Serve with a squeeze of lime and garnish with cilantro.